I am proud to say one of my kitchens was featured on Cultivate.com (Pottery Barn & Williams and Sonoma’s kitchen website). I hope you enjoy the article! This wonderful, clean room in Maine combines the best of kitchen living, with a seamlessly integrated seating area and sun-drenched dining nook both just steps from the main cooking space. During phase one of this two-part remodel, the homeowners added a new mudroom, prefinished white oak flooring, and removed most of the walls on the first floor. 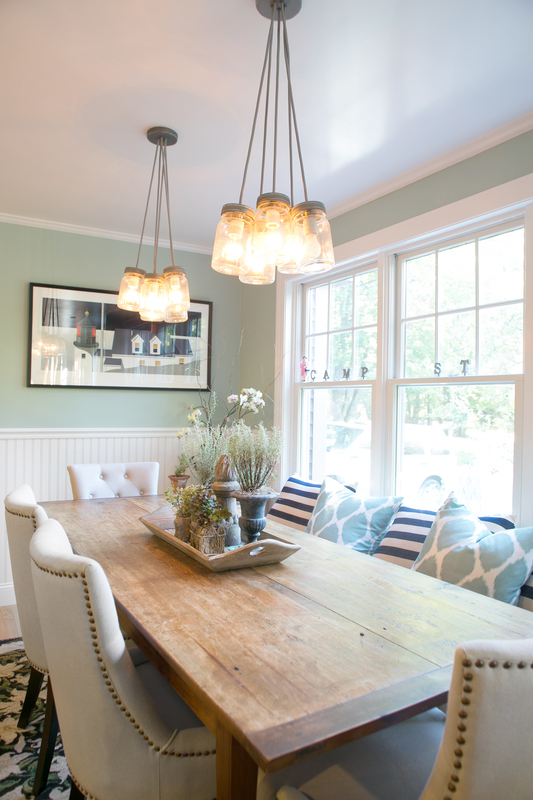 “This dining area was a part of phase one, and it is amazing,” designer Celia St. Onge says. “It added not only seating but tons of light! 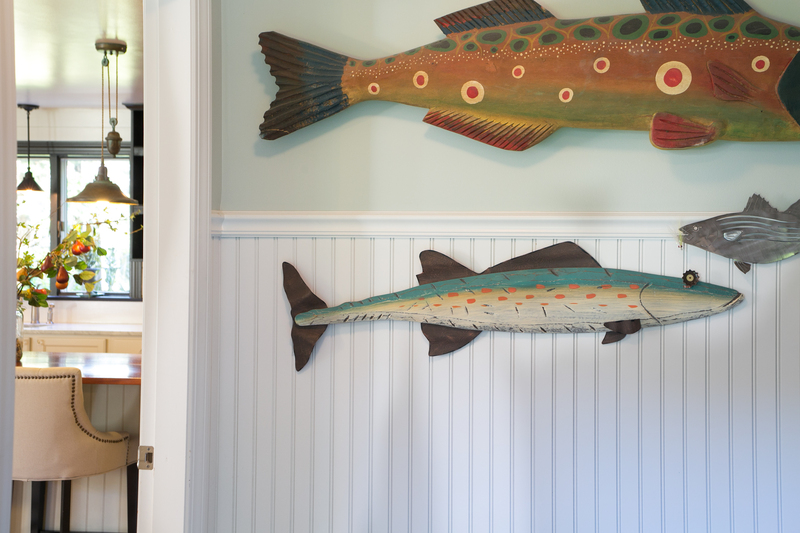 There used to be a covered porch in this space that kept the sun from getting in.” A half-wall of beaded board is crisp against gray-blue paint and also gives a slight nod to the home’s coastal Maine location. “One other thing I love that we did as part of the first phase was turn the former garage entry into a large pantry (next to the refrigerator). The homeowners can walk straight in from the grocery store and put everything away at once,” she says. Phase two focused on the kitchen redo, which included new cabinetry, countertops, and lighting. Celia pulled the color palette in from the nearby Casco Bay, which is just a quarter-mile from the home. “Fog is common place in this area and the tones in the kitchen are all found in fog, gray, greige and tans. I wanted the room to feel crisp and cool but also welcoming,” she says. To combat the light, earthy tones, Celia installed a small open cabinetry unit between the two windows, which she painted black. “This shelf is one of the items from my coastal furniture line. I design and build it in Maine, and it is manufactured by special needs adults. I am so proud of what they have built!” Celia says. All white pieces displayed neatly inside highlight the dark color of the cabinet. Black window casings and black tile around the vent hood add a similarly bold pop. 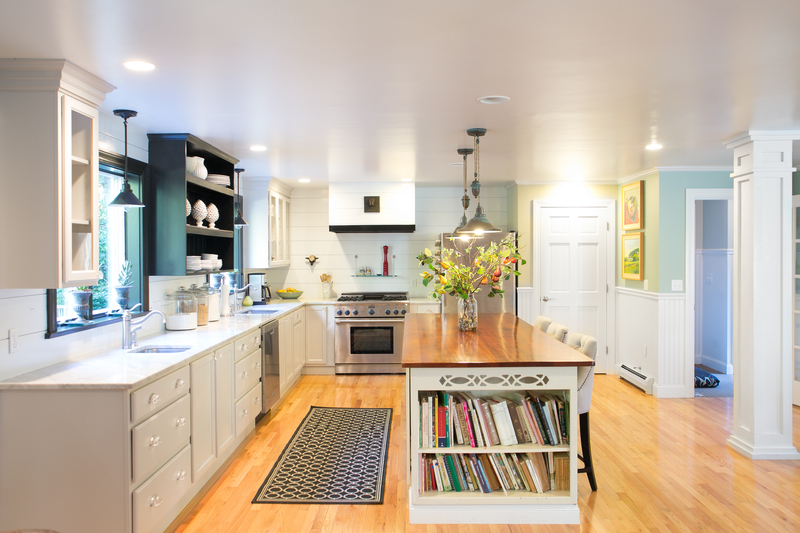 “I wanted the overall feel of the kitchen to be calm, but it would have felt bland if I had not picked a strong contrast color,” says Celia. 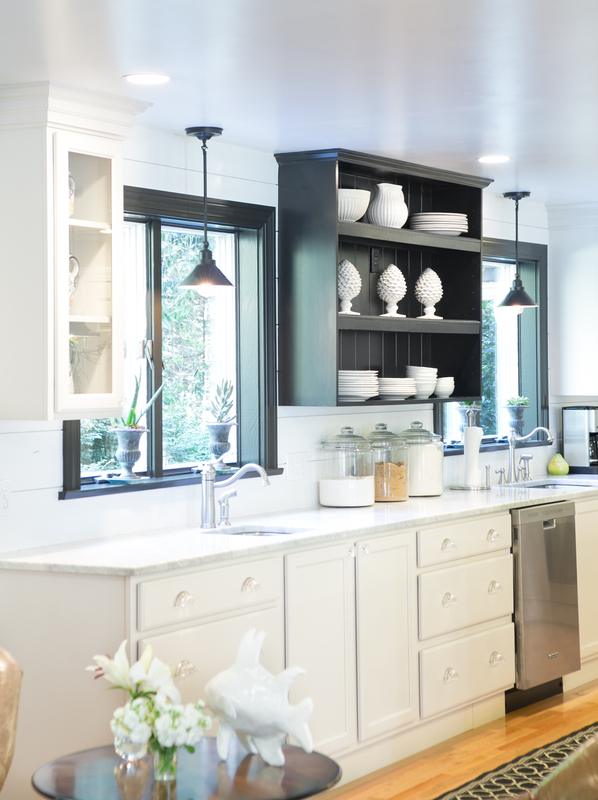 “Nothing could do the job like black!” Behind the black and white range also lies Celia’s favorite element in the entire kitchen: “I love that nickel gap board backsplash,” she says. Across from the windows sits a rich, wood-topped island. At the end, narrow shelves supply a convenient spot to store cookbooks at the ready. Three upholstered barstools are elegant, and their black legs tie in with the other dark elements along the window wall. Matching tufted linen chairs in the adjacent dining nook tie together the two spaces. Rounding out the room is symmetrical storage space. “I like simple design, so one thing we did in this kitchen was to use banks of drawers and full height drawers, but no combinations. 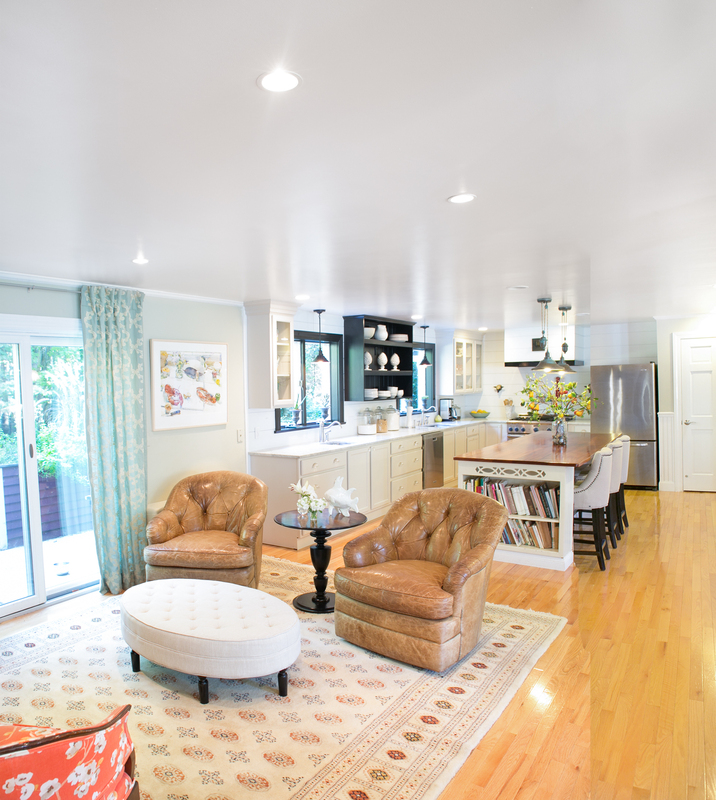 I love the result, it is so clean and every bit of space is used,” notes Celia. Reblogged this on The Dyslexic Designer.